Imagine is SHARE Family & Community Services annual fundraiser. SHARE is a non-profit, independent, community based organization providing leadership and programs in response to the social needs of the residents of the Tri-Cities (Coquitlam, Port Coquitlam, Port Moody, Anmore and Belcarra), New Westminster and adjacent communities. Together, our community helps raise money for SHARE’s under & unfunded programs and services. 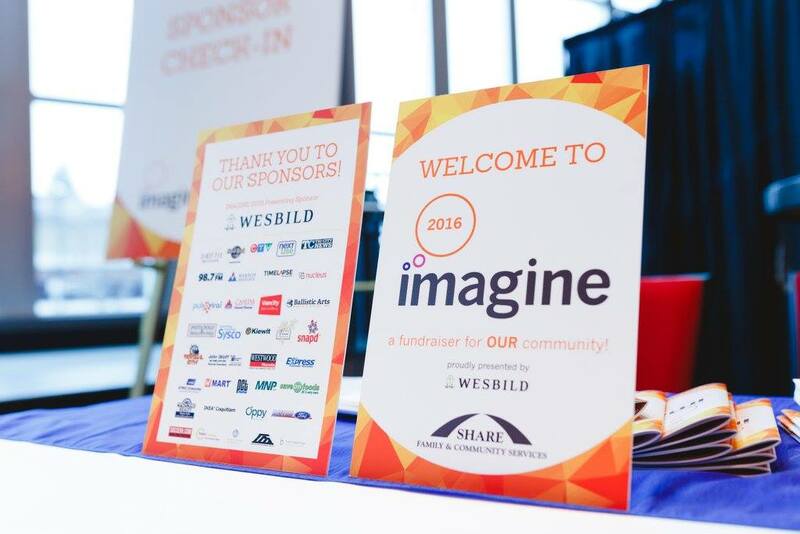 Wesbild is pleased to be the Presenting Sponsor for Imagine to help raise much needed funds to support our communities’ most vulnerable. Imagine ensures that SHARE can fill Food Bank with food to help feed those in our community who are hungry, provide support for refugees and new comers to our community and support youth battling with addiction issue. This fundraiser also helps provide counseling for kids struggling with bullying at school, provide support for kids and youth with development delays and disabilities in their Community Living program Support our Speech, Physical, and Occupational Therapists with the tools they need to help children with developmental disabilities or delays say their first word or take their first steps. Wesbild is proud to be a part of this important community event.